Just when you thought vinyl records were being consigned to the dustbin of musical history, something comes along to make them relevant again. Sleeveface started in a Cardiff bar and is fast becoming an internet phenomenon requiring just a record sleeve, a camera and big dollops of imagination. Put the sleeve in front of your face, strike the pose of the rock god you've chosen, and get yourself photographed. Er, that's it. It's easy but it helps if you have a big record collection. Step forward John Rostron, of Cardiff, one of the original faces behind the sleeves and a man boasting a record collection of around 6,000. 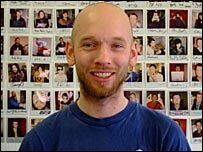 Mr Rostron who works as a music promoter for Plug Two in Cardiff Bay, said it all started last April when some friends were DJ-ing at Cafe Bar Europa in Cardiff and started messing around with album sleeves. "They held up a couple of sleeves in front of their faces and took a picture. "We showed them at work and we thought it was good fun, took some more the next week and put them on a website," he said. But what started as a bit of fun among friends soon grew into something more substantial as word spread on the internet. Sleeveface has its own website, material on video sharing site YouTube, and a presence on social networking site Facebook which has almost 5,000 members. There have been pictures posted from Sleevefacers in the USA, France, Germany, Japan, Russia, Iceland and Israel, as well as the UK. And that's not to mention the media coverage that has included features in the Observer and Guardian newspapers. The Guardian even made Sleeveface its Facebook group of the year. And record shops haven't been slow to make the most of their vinyl wares. 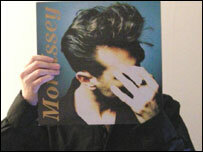 Mr Rostron has had calls from record stores where customers have been picking up records and sleevefacing with them. He said one store in London even wants to host a Sleeveface exhibition. What next? Sleeveface, the movie? Well, there is a book in the pipeline. 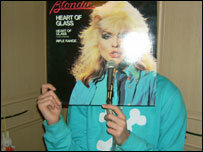 Mr Rostron has been contacted by an American publisher who wanted to feature some of the best Sleeveface pictures. He said: "We're having lots of fun putting the book together. We're doing something that's not our jobs but it's fun and it's positive. "We're going to organise some Sleeveface parties where we can meet up. We've made lots of new friends."